Last Saturday, it was hot out. I don’t know if you know this about me, but there is a reason God made me a Yankee: I do not deal well with the heat. I do not glow, I sweat. And I complain, because when I am miserable, I like to drag my friends along with me. So, while my parents and I attended the Made in New York event on Saturday in Sackets Harbor with a cheerful outlook and decked out in our BHS t-shirts, it was not a day without its share of kvetching. I don’t think the sweat stopped pouring down my face the entire time we were there. 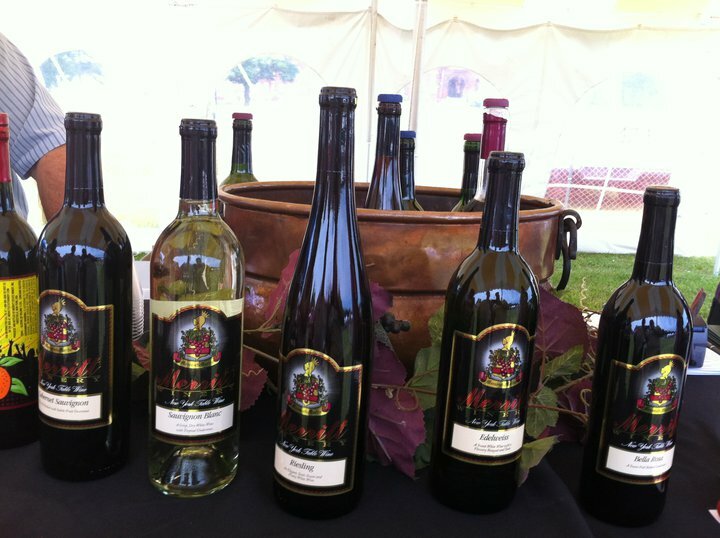 The event, held on the polo field/parade grounds at historic Madison Barracks, was a great chance for NNYers to taste wines and delicacies from all over our great state. And since it was too hot to really eat anything substantial, the hoards moving from wine tent to wine tent were jovial and plentiful. 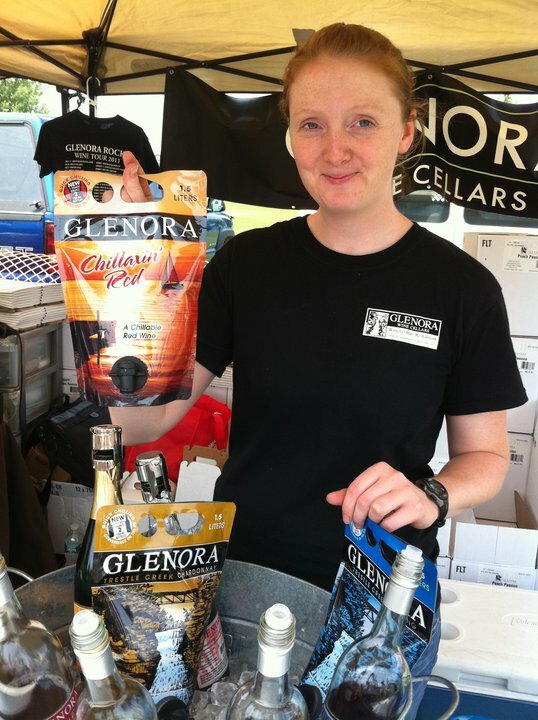 And unlike my usual Cayuga Lake-centered wine sampling, wineries from all over the state were represented at the event. 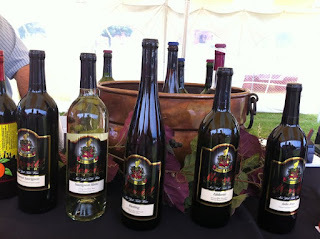 We first bellied up to Merritt Winery’s tent, hailing from Forestville, which is out near Buffalo in Chautauqua County. I avoided the wine slushie offering here, knowing that one of those might take me down for the afternoon in that sweltering heat, and went for their sauvignon blanc, which is a unique varietal for a NYS vineyard. I found it to be surprisingly delightful, unlike a lot of drier New York whites. I’ve never seen Merritt offered in our local wine shops, but if I did, I would try this one again. Further down on the line, Lime Berry Wine Estate, out of Hammondsport, had a fun crew and a lighthearted feel. This is good time wine! The Cayuga White and the Riesling here were both a little on the sweet side for my palette, but that’s not to say I didn’t enjoy them. For some savory flavor, try the elk slim jims from Apple Grove Farms in Mexico. Less salty and fatty than actual Slim Jims, these sausage treats were better textured and more flavorful without wicking every vestige of saliva from your mouth or making you want to chug 10 beers. Old standby Glenora Wine Cellars was in attendance, and they had some new offerings since I last graced their tasting room: most notably a Pomegranate Pizzazz beverage not unlike wine coolers of old, except for the fact that it was totally delicious with none of the queasiness-inducing saccharine sweetness I usually abhor in such drinks. And the friendly pourer, Barb, was generous with her samples and enthused to hear I had visited the Glenora tasting room in the past. I never thought I would admit this, but I wish I had bought a bottle of this yummy “wine beverage.” The heat made me so distracted, I didn’t circle back to all the tents I wish I had to make purchases. 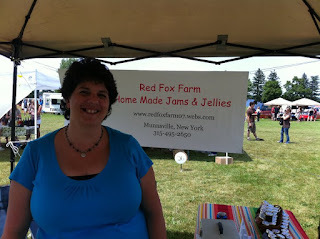 One of my fav scores of the day was carrot cake jelly at the Red Fox Farm tent. It has the texture of marmalade and all the flavor of one of my favorite desserts ever. I can’t wait to have Shawn taste this, and it was a steal, at $5 for a great, big jar. I tried to give them $5 for a little tiny jar, but the Red Fox lady was very honest and ponied up the large size. See? Local food purveyors are good people. I am tempted to buy a whole bunch of scones after work today at Wegmans, and then have them for breakfast all this week with gobs of butter and this jelly. Oh God, now that I’ve put that in writing, I don’t know that I can NOT do it! The clever folks at another 10X10 pantheon of goodness, Sweetrees Farms, were enticing people in with free samples of maple cotton candy. Sounds funky, but it was a total home run, and I couldn’t resist buying a little jar of maple jelly, which would be divine on raisin toast or sharing a toasted slice of Italian bread with sweet butter and a sprinkle of cinnamon. 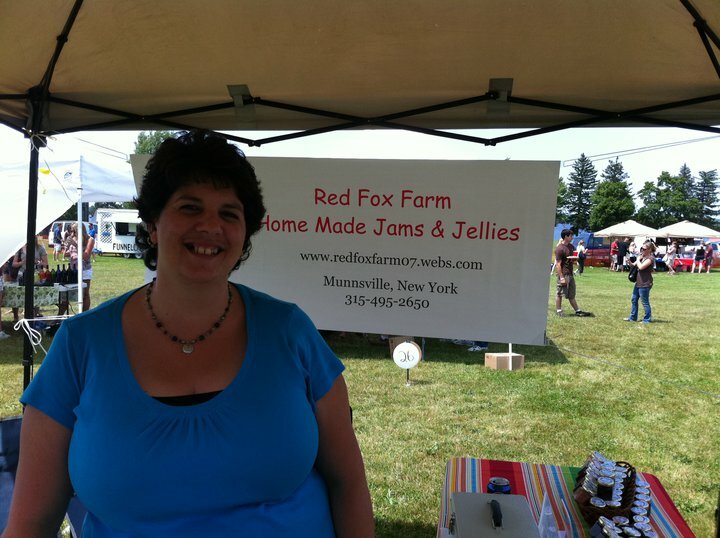 This lady makes carrot cake jelly. I know! 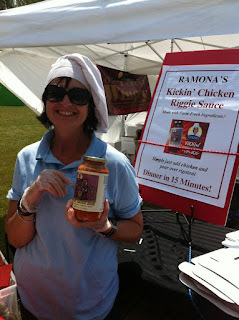 Another fun person to meet, and purveyor of really unique and fun products, was Ramon of Ramona’s Kickin’ Chicken Dressings and Marinades. From Syracuse, Ramona makes a ready-made jarred sauce for the Central NY favorite chicken riggies, which is basically chicken with rigatoni and vegetables in a spicy red sauce. 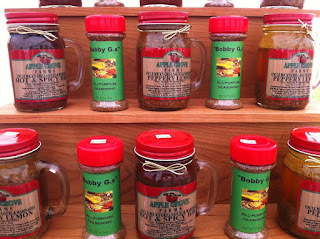 She also has a line of very flavorful marinades that double as dressings. I sampled both the riggie sauce and the Greek marinade, and was compelled to purchase the Greek marinade, which was absolutely dynamite on a little scrap of torn pita bread. I plan to marinate chicken in this tonight for some killer souvlaki, and I’m salivating just thinking about how good dinner is going to be. Ramona is a little wacky and was really psyched that I’d be featuring her in my blog, and that’s exactly the kind of person I want to give some publicity to through Big Hungry Shelby: small business owners who are passionate about yummy food and completely enthusiastic to talk about it and promote our local products. Ramona’s Citrus Greek Marinade is jam packed with feta saltiness and richness – way more flavor and fresher tasting than the Wegmans equivalent. Seriously, I can’t wait for dinner tonight! 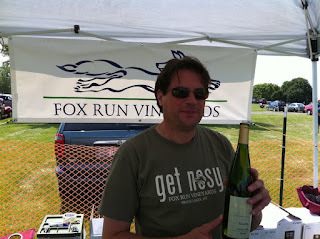 One of our last stops on our jaunt around the Barracks field was at Fox Run Vineyards’ tent. This Seneca Lake winery is one of the more venerable of the Finger Lakes’ and their wines tell that tale: the Riesling here was crisp and assertive. I bought a bottle to take to the cookout we were invited to, and was glad to pay the $13 for this excellent bottle. Rieslings are to the Finger Lakes what Cabernets and Chardonnays are to California – good because of the unique terroir created by the soil and climate in the area. If you’re new to wine or to New York wines in particular, a Riesling is a good place to start. While my absolute favorite would be the Dry Riesling from Chateau Lafayette Reneau, the 2009 Riesling from Fox Run is a really good choice for substitution. This would be a fabulous wine with spicy food – think an upscale fajita night or some grilled pork chops smothered in a bell pepper and hot chili marsala-butter sauce. Yum. His shirt says, “Get Nosy.” Hee. All in all, despite the flop sweat pouring down my face and trying to get some actual face time in with the winery people amidst the hoards of good-time revelers, we had a great time at the Made in New York event. I actually wish there had been more food stalls – there was an intriguing German food stand selling schnitzel, potato salad and brats I would have liked to try on a cooler day, but somehow meat just wasn’t appetizing in the intense heat and sunshine. Plus, though I think it’s been well proven that most folks like to sit down to eat, there was no dining tent or even picnic table area at the event – a good addition for a future year. It was fun to meet some of the people behind the burgeoning New York local food scene. There is such a rich tradition of agriculture-turned-gourmet foodstuffs here, and to find so much of it in one place is a special experience. If you have the opportunity to attend an event like this in your corner of the world, I encourage your attendance! The past week has been chock full of dining out, and I have tons to share in the coming weeks – I’m so excited! From foie gras burger sliders to Dogfish Head beer and a sandwich called pork-sket, I have a ton of yummy food coming your way, Big Hungries. Stayed tuned here on NNYorker, and join our group on Facebook or follow my tweets @BigHungryShelby for all the juicy details. My personality is big; my hunger is bigger!